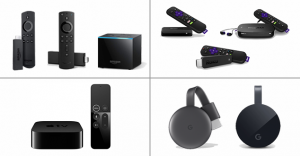 This chart compares several features of the Amazon Fire TV, Roku, Apple TV, and Google Chromecast streaming media players, including price, TV and Internet connection options, supported content providers and additional features specific to each one. The chart does not compare streaming performance, ease of setup, or ease of navigating each device’s user interface because I haven’t really found a significant difference between any of them. Below the chart, you’ll find a list of frequently asked questions about streaming media players and content. Note: This chart was last updated on November 20, 2018. Information may change at any time. For complete, up-to-date details about any of these devices, please visit the device manufacturer’s website. If you find any errors, please let me know at elizabeth@techforluddites.com. NOTE: May be limited to certain models and geographies. Check with device manufacturer to confirm availability. The links below will take you to the Streaming Media FAQ page that has answers to questions relevant to streaming players and content in general. Do I need a computer to use a streaming media player? Do I need Internet service to use a streaming media player? How fast does my Internet connection need to be for streaming movies and TV shows? How many gigs of data do I need to watch streaming media? Can I stream content using my cellphone's data plan? I have a limited data plan with my Internet service provider. Does my player stream data even when I'm not using it? Can I use a VPN service with a streaming media player? Do I need cable or satellite service to use a streaming media player? How does a streaming media player work with my cable/satellite service? Can I watch "regular TV" through a streaming player? If I have a streaming media player and an antenna, can I cancel my cable/satellite service? Do I need a Smart TV to use a streaming media player? All my HDMI ports are already being used. Is there a way to add a streaming player without unplugging another device? Can I connect multiple streaming players to the same TV? I have multiple TVs. Do I need a separate player for each one? Can I use a streaming media player with an older TV? How do I switch back to watch regular TV? If I buy a Roku/Fire TV/Apple TV/Chromecast, is that a one-time cost or do I have to pay annually? If I buy a streaming media player, why do I need to pay to watch videos? What are the costs of the various streaming services you can use with your streaming media player? Can I watch videos saved on my computer, phone, tablet, or external hard drive on TV using a streaming media player? Can I use a streaming media player outside the United States? Can I record streaming videos with my DVR?